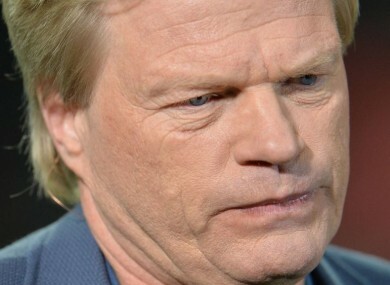 FORMER GERMAN GOALKEEPER Oliver Kahn has lost a case he brought to the European Court of Human Rights (ECHR) over images of his children being published in two magazines. Kahn’s children with his ex-wife Simone, Katharina-Maria and David, were born in 1998 and 2003 respectively. Between July 2004 and June 2009 the magazines Neue Woche and Viel Spass, owned by the same publisher, printed several photos of the family. In 2005 the Hamburg Regional Court ordered the publisher to refrain from printing any of the photos or risk a fine for non-compliance. Following the publication of another set of photos in 2007, the applicants obtained three orders against the publisher requiring it to pay successive fines of €5,000, €7,500 and €15,000. In December 2007 the applicants applied to the Hamburg Regional Court for an order requiring the publisher to pay them at least €40,000 each for publishing the photos without their consent. In two judgments on 11 July 2008 the Regional Court found in the applicants’ favour and awarded them the sums claimed. The court considered that there had been a serious breach of their right to privacy. The Hamburg Court of Appeal quashed this judgement in November of that year. It accepted that the publisher had persistently breached the blanket ban on publishing the images, despite the fines that had already been imposed. However, the court held that it was not necessary to award additional compensation. The subject of the reports had not been the children themselves, rather their parents’ marriage breakdown and their father’s career. On 23 September 2009 a three-judge formation of the Federal Constitutional Court declined to examine constitutional appeals lodged by Kahn and his ex-wife. He brought the case to the ECHR under Article 8 (right to respect for private and family life) of the European Convention on Human Rights. It was lodged on 22 March 2010. The ECHR concluded that German authorities had not failed in their obligation to provide protection for Kahn’s family and their right to privacy. The court accepted the finding of the German courts that, in view of the nature of the photos, there had been no reason to award additional compensation. Email “Oliver Kahn loses court case over photos of his children being published despite ban”. Feedback on “Oliver Kahn loses court case over photos of his children being published despite ban”.